The RAF's next generation military transport aircraft has officially been named Atlas at the Royal International Air Tattoo, which is taking place at RAF Fairford in Gloucestershire. 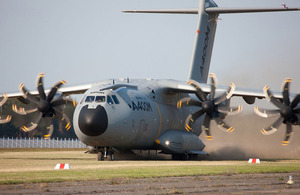 The aircraft, which has until now been known as the A400M, will replace the RAF’s existing C-130 Hercules fleet and, along with the Voyager and C-17, will provide the UK military’s future air transport force. The UK is buying 22 of the aircraft from Airbus Military, and the first Atlas is expected to be delivered to the RAF in 2014. Able to carry twice as much as the Hercules, Atlas can transport 32 tonnes of cargo over a range of 4,500km, providing unprecedented capability to support the UK Armed Forces. It can move up to 116 paratroopers and large armoured vehicles such as Mastiffs as well as vast amounts of humanitarian and disaster relief. The aircraft’s ability to land on semi-permanent runways and rough ground means Atlas can fly its cargo into the centre of operations, supplying tactical forward bases or evacuating casualties or refugees. Atlas will be a uniquely capable aircraft and will provide both tactical and strategic airlift capabilities for use in peace, crisis and war. The name Atlas reflects the potential of this mighty aircraft to provide help and support to our Armed Forces and others in need across the globe. The programme is a good example of how European partners can work together to deliver world-class military capability. 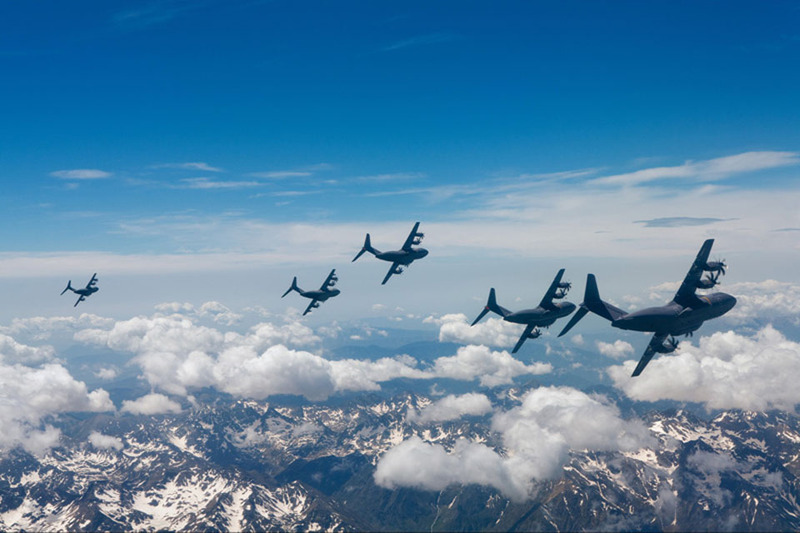 Atlas is going to be a major capability for Defence and the Royal Air Force is looking forward to Atlas joining our world-class fleet of air mobility aircraft. Atlas will offer a step-change in the Royal Air Force’s capability, and with its significant payload it will be able to transport every type of UK protected mobility vehicle directly to where they are needed as well as supporting forces on the ground through significant tactical air drops. Atlas, together with the C-17 Globemaster, C-130J Hercules and the new Voyager aircraft now entering service with the RAF, will give us the ability to rapidly move people and equipment around the globe for military and humanitarian operations for decades ahead. The UK is one of seven nations who will be purchasing Atlas from Airbus Military. The development and build of the aircraft has created or secured work for 8,000 people in the UK.